The transition from primary to secondary school in the UK is not always an easy one, and parents who wish to encourage their children to develop good reading and writing habits might be on the look out for a book such as ‘Testing KS3 English – Year 7‘. The book contains six test papers, each of which focuses on a particular topic such as school, monsters, woodlands or football. Each test paper includes three passages for reading followed by comprehension questions of different types and then a writing test related to the topic. For example, Test Paper 3, entitled Times of celebration, has an extract on Christmas, a fictional passage centring on bonfire night, and a poem entitled ‘Diwali in Kerala’. In actual fact each test paper features one poem. Every writing test has both a major and a minor task: for Test Paper 3, the major task requires the pupil to ‘write an account of the most memorable celebration’ he or she can remember; the minor task is to write an email or letter to an overseas friend who is going to visit at the time of a major festival and needs advice on how to prepare for it. Planning advice is given for each writing task. My sweet Airdrie and I. Another passage in the same test paper is entitled ‘A Legend in his Own Time’ and is a biographical tribute written by Joe Mercer when Bill Shankly retired as manager of Liverpool in 1974. I do tend to find that eleven- to twelve-year-olds have often not heard of Shankly and I wonder if a slightly more up-to-date extract would have been more appropriate. Each reading passage is followed by about six to eight questions of different types. Each question is presented in a box and shows how many marks are awarded for the answer. There is also within the box an indication of the focus of the question, in other words which learning objective is being tested, for example ‘deduce, infer and interpret information and events or ideas from the text’. Helpful advice on how to go about answering is often given below each question. The first couple of questions on each text usually require the pupil to ‘select and copy’ certain words or phrases; for example for the passage on Christmas asks for ‘three details … which explain why “primitive farming peoples” needed a winter celebration’. Subsequent questions necessitate writing full sentences or presenting information in the form of a chart. Some answers will be purely factual whereas others address the writer’s use of language. The final question on each extract requires a longer answer for which three or four marks would be awarded and it often sums up points already considered in other questions. To give an example, for the passage on the Loch Ness monster, the question is to ‘Comment on the writer’s attitude to the Loch Ness monster and how he communicates this in the writing.’ There are then four bullet points to guide the pupil as to what should be included in the answer. Overall I do feel that this is a very useful book for eleven- to twelve-year-olds starting out on their secondary education. There is a good variety of texts, from Martin Wainwright’s newspaper article ‘Chicken fat to power lorries’ to the wonderful descriptive writing of Kenneth Grahame in ‘The Wind in the Willows’. One or two of the extracts are rather long, and Tennyson’s poem ‘The Kraken’ necessitates a glossary for seven of its more unusual words. There is plenty to challenge the more able pupils, but others may find some of the material difficult to get to grips with. The questions on the three reading tests in each paper are intended to be answered in one hour and fifteen minutes, with fifteen minutes’ reading time before this. The major writing task is to be completed in forty minutes, the minor one in twenty-five. I have not personally tried these out as timed tests, as I use them for one-to-one tuition with children who are not usually of above-average ability. I take the reading passages one at a time and give guidance answering the questions, and I don’t always do the tests in chronological order. I do sometimes feel that perhaps too many of the questions rely purely on copying out phrases and filling in charts rather than forming good sentences, but the final question on each extract gives an opportunity for an extended answer, which is something that definitely needs to be given practice in the build up to a more advanced level of work. Each of the extracts is accompanied by a colour illustration which gives a little encouragement to any child who is not by this stage a confident reader. The font is quite small, and I have sometimes found that less able children need the help of a ruler to place under the lines of text as they read; a full page of text can still prove quite daunting to some eleven-year-olds. 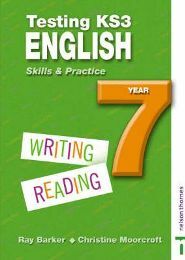 This type of textbook for this age group is quite hard to come by, and I would recommend it to any parent who is home-schooling their child or wishes to give a child attending school additional practice in English at home, possibly during the longer breaks. If a child is particularly reluctant, I would suggest picking out any reading passages that might have a special interest for them, be it football or monsters. No Comments on "Testing KS3 English Skills and Practice Year 7"